The Value of Ecocriticism offers a brief, incisive overview of the fast-changing field of environmental literary criticism in a bewildering age of global environmental threat. The intellectual, moral and political complexity of environmental issues, especially at the global scale (the so-called 'Anthropocene') forms a new challenge of inventiveness for both literature and criticism. Ecocriticism has been going through a period of radical change and has become a diverse and huge field on the exciting but unstable boundary between the humanities and the sciences, with a mix of cultural, political, scientific and activist strands. Its mantra is that the environmental crisis demands a reconsideration of society's basic values, constitution and purposes, and that art and literature can be vital in that work. 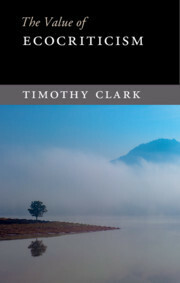 As a leading figure in this field, Timothy Clark surveys recent developments in ecocriticism lucidly, but also sometimes critically. This book examines ecopoetics, material ecocriticism, and the ideas of world literature as well as contentious claims that we are living in a new geological epoch. 1. The 'Anthropocene'? : Nature and complexity; 2. Scalar literacy; 3. Ecopoetry; 4. The challenge for prose narrative; 5. Material ecocriticism; 6. 'Postcolonial ecocriticism' … and beyond?